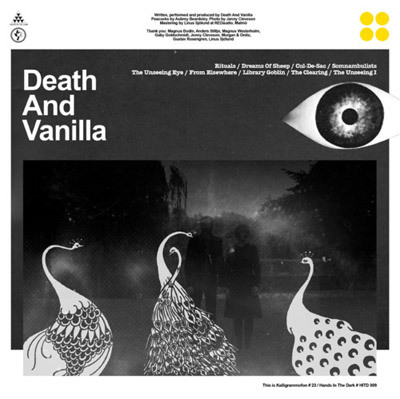 The newest album from Swedish group Death and Vanilla is an example of modern capabilities applied to classic musical tropes. Not that the band manages to pull it off perfectly, or always draw from the best influences — making for a muddy listen at times — but the self-titled album is at least an intriguing ride. More than anything, Death and Vanilla’s sound is like an elaborate dreamscape composed of foggy visions and mind-altering notions, but it’s also easy-going and enjoyable upon the first listen. To be both pretentiously obscure yet accessible is a combination few bands are able to pull off, so in that sense, I was immediately impressed. The album begins with “Rituals,” a reverb-drenched song that sounds like something designed for the end credits of a psychological thriller, fading to black as patrons turn their backs and exit slowly to echoing guitars and hissing keyboards drowning out their despair. “Rituals” and the following “Dreams of Sheep” are both particularly forgettable songs, a slow start on the debut album. But as Death and Vanilla’s third track “Cul-De-Sac” hits, the album takes a turn for the best. It’s not as if the album all of a sudden becomes sunshine and rainbows, but the rhythm and tempo of the tracks begin to pick up, and the band’s pop sensibility begins to show itself. The guitar sounds sharp and quick, and although the lead singer’s voice still sounds as if it was recorded on an ancient microphone halfway across an empty room, there’s suddenly a liveliness to the music that makes it unique. “Cul-De-Sac” is catchy and instantly had me reaching for the repeat button, and as the rest of the album carried on, I continued to have this feeling. “The Unseeing Eye” is another example of this kind of Balearic-gone-bad trip, a rain-soaked track that’s equal parts haunting and beautiful. In a lot of ways, the album reminds me of last year’s Cat’s Eyes record, which I also enjoyed coming back to over and over again thanks to its non-abrasive nature and gorgeous vocal-instrumental juxtaposition. And that’s ultimately how I felt about Death and Vanilla. It’s a good album that I will enjoy coming back to throughout time, but there’s really nothing here that will make it stand out amongst its peers. Although certain songs stick out and catch my attention, most of them drift on with varying degrees of success. The Swedish duo’s commitment to a singular sound is admirable, but their inability to take that sound and make it their own is ultimately their downfall. Sign me up for a second album, as I think there’s huge potential and also huge room for improvement, but for now Death and Vanilla might be rightly overlooked.